San Jose del Cabo has long been a place for tourists to browse stores for goodies such silver, jewelry and souviners from their Cabo vacation. Susanna Bueno, Director and Head Designer for SAX Jewels, chatted a little bit with us about her store and shopping for silver in Cabo. SAX is located in San Jose del Cabo in the downtown San Jose Historic District as well as at the Shoppes at Palmilla. Her store has recently added the addition of resort wear clothing, shoes and gorgeous gifts/souvenirs. What made you come to Los Cabos? My family moved down here, something like 30 years ago, and had the very first shop for tourists in Los Cabos. Wow! What was Los Cabos like back then? There was nothing in San Jose del Cabo back then. I remember a lot of Hollywood celebrities would come into our store in San Jose during those times. And I didn’t even recognize them – satellite TV did not exist here yet! They were very popular – Sylvestor Stalone, Arnold Schwarzenegger, Mary Kay and Raquel Welsh among others. Now you have your own store. What Celebrities have visited you? Mary Kay used to be a good client, Demi Moore bought a bracelet from us. Halle Berry and the First Lady of Tai Pei, Adela Micha, Gaby Vargas, among others. When they come to our shop, we close our doors for a few minutes to give them privacy. What do you sell at SAX? SAX jewels is considered an icon of passion for unique jewels and accessories. At our SAX Palmilla location, we have added a fabulous Resort Wear line of clothing complemented with lots of gorgeous accessories. For men, we make money clips, cuff links or personalized items. We can also provide corporate gifts. Do you make all of the jewelry yourself? Not Really. I design special collections here in my studio with the help of my family and our 3rd generation Taxco jeweler. 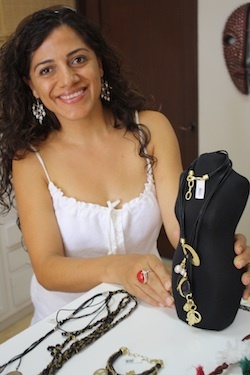 I also carry a great selection of other Mexican and Latin American talented designers. What kind of jewelry collections do you make? I incorporate Mexican traditions and ideas into my jewelry. Every time I feel deeply inspired by something, that’s when the idea starts. I mostly work with silver, brass, opals, shells, crystals, but also with unusual items like fabric, recycled materials etc. Silver is popular in Cabo. Why? When you come to Mexico, you want to invest in silver because Mexico is one of the top silver producers in the world. The silver jewelry you can buy here in Mexico – especially at my stores – is better quality than the rest of the world’s because we use sterling silver hallmark .925 sometimes .999. That means there is 92.5% or 99% pure silver in every piece while others places sell silver that are not as high in purity like .725 or less. Every time you buy silver jewelry from us is a beautiful investment to wear. Wow! How do you spot real silver? You always want to look for the .925 or .999 hallmark and buy from a reputable source that will be here when you come back. Especially now that silver has increased 120% in the last year! Do you help people choose the perfect designs? Of course we do! And is based on the face form, hear, and clients life style, but I have to remark jewelry is so much of an attitude and personality. I like to see jewels like an extension of art; this is really my passion. The key phrase here is -Let the Magic Happen, yes! Trust what you like form heart and if you are still not convinced I’m sure that with a little bit of styling rules you will find out that Yes! You can wear that BIG cocktail ring! – even if you think you are to small for it. You’ll start seeing that you can actually wear long necklaces or big earrings or statement bracelets with style. And Yes! You will look fantastic! People get amazed how it actually works! Do you have a question for Susana? Let us know and we’ll ask her!